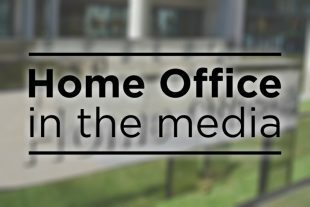 Today's Home Office related stories include reports on the new police database. The Guardian reports that a new super database being built for the police represents a 'grave' risk to privacy, according to human rights group Liberty. According to the piece, Liberty claim the Government is glossing over concerns that the database – the largest built for British law enforcement – threatens civil liberties. The piece carried a Home Office response noting that the database is a vital tool that is used every day. The Police National Database and Police National Computer are vital tools that are used every day by the police to safeguard the public, prevent crime and bring perpetrators to justice. These two separate systems are nearing the end of their lives. By bringing them together onto a single joined-up platform, the Law Enforcement Data Service will ensure existing capabilities are maintained. This is a complex project and that is why we are continuing to engage constructively with civil society organisations on its development to ensure the use of personal data is proportionate and respects the privacy of individuals.